Overijssel is divided into the regions of Salland, Kop van Overijssel, and Twente. Many of the province’s 1.1 million inhabitants live in old towns, amid beautiful forests and near medieval castles. 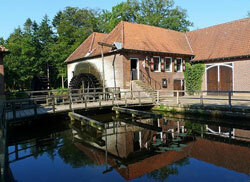 The small town of Kampen alone counts about 500 historic buildings. Another small community, Geithoorn, has an abundance of canals and waterways, and the chief method of transportation in the town is by punt. The provincial capital, Zwolle, was a major centre of European trade and commerce in the Middle Ages, and the city retains much of the architectural charm of the old days. Its attractions include an environmental theme park and the Stedelijk Museum, which features medieval and contemporary art. Another prominent town in Overijssel is Deventer, which celebrates three big cultural events every year: the Deventer Op Stelten, a three-day festival in which performers from the Netherlands and other Western European countries mount musical and theatrical productions on stilts; a book fair, the largest in Europe, held every August; and the Dickens Festival in December, which honours Charles Dickens’ writings and draws over 150,000 visitors every year. Staying in rustic farmhouses amid rolling green meadows in Twente, Vechte and Salland is becoming a popular choice of vacation among the Dutch. The nearby Overijssel Beach is another lure. Industry employs a quarter of the province’s workforce. In recent years, Twente’s flourishing textiles industry has provided a boost to the province’s economy.